Baccarat is one of the most popular casino games around. Only roulette and blackjack take up more space in the table games section of UK casino sites. It is also a mainstay of live dealer casinos and, as such, you might want to find out how to play live baccarat. If you are looking to bring the thrill of the bricks and mortar casino into your home or commute, take a look at this article. Find out how to play baccarat, where you can play it live, and what to expect. Here is how to play live baccarat. Before getting into the logistics of playing live baccarat specifically, you need to know the rules. Baccarat is a simple and fun game. The dealer, or banker, distributes two sets of two cards, designated for the player and themselves. The winner is the one whose two cards equal closest to nine. Cards 2 to 9 are worth the value written on them. Ten, jack, queen and king are worth nothing, and the ace is worth one. There is a 3 and a 6, which equals 9. There is a 9 and a 3, which comes to 12. As this is over 9, you drop the 1, leaving a score of 2. This is not a game you play one-on-one with the banker, but they merely brand the two hands ‘player’ and ‘banker’. You can back the player, the banker, or a tie, winning a prize if you guess correctly. If either player or banker picks up 8 or 9, both stand (ie. not receive another card). Player stands on 6, 7, 8 or 9. If they hit 5 or less, they get another card. If the player stands, banker gets another card if they are on 5 or less on their first two cards. Bet on player and player wins – double your stake. Stake on banker and banker wins – win 95% of your stake. Choose a tie and banker and player have the same value – eight times your stake. 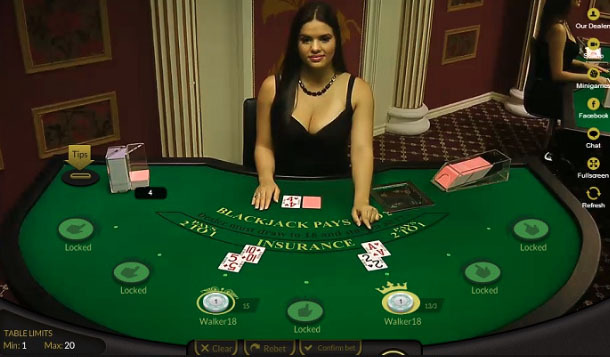 The first thing you need to do is find a UK casino site that offers live dealer baccarat. SpinCazino’s online casino reviews detail the number and types of live baccarat offered by each new casino site. Once you have found a site that sounds like it suits your needs (check the welcome bonus, wagering requirements, licencing and more too), follow the link and sign up. Signing up at an online casino is a simple affair. You enter your details, confirm the account and then fund it. UK casino sites accept a range of payment methods, from credit and debit cards to eWallets and prepayment cards. Use your preferred method and then use the funds to pay for your live baccarat stakes. When you learn how to play live baccarat, you will notice that many new casino sites provide lots of different baccarat games. These could be from different game providers, or be tailored towards different stake levels. When it comes to choosing whether you are a high, medium or low roller, you need to look at your experience and bankroll. 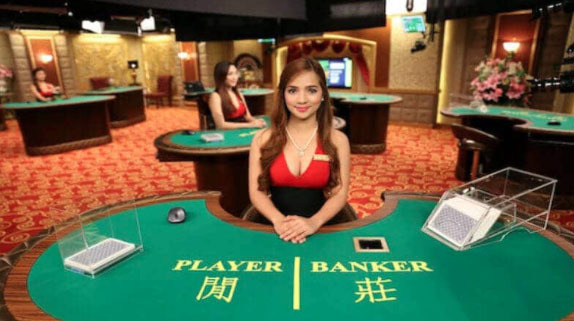 If you have played baccarat on a virtual table or at a land based casino before and have a hefty bankroll, you might think about joining the high stakes table. If you have not played any form of baccarat before and are on a tight budget, you should opt for a low stakes live baccarat game. As for game providers, that is down to personal taste. You might prefer the way the dealers interact on a game from NetEnt than the way the Evolution Gaming bankers do. Perhaps the Microgaming tables appeal more to your eyes. The only way you can tell which software company’s titles you prefer is to play with them. Experience will help you decide what is important for you. There are also variations on the way dealers distribute the cards, for instance you can play a faster version on a speed deal table. Once you join a live baccarat table, you will see a real life dealer standing by a deck of cards at a table. Sometimes the table is real, sometimes the betting areas are virtual. Sometimes you occupy the only betting area, other sites have you take a seat at a multiplay table. As it happens, all tables are used by multiple players at the same time, these are just used for show. The dealer will talk you through what is happening, what the scores are, who the winner is. They will also explain why they are standing or turning another card. The dealer does all the work in baccarat, playing for themselves and the player. You just watch, find out who won and place your stakes for the next round. Any money you win goes straight into your player account and you can use it to fund new games, or you can choose to withdraw it. Now you know how to play live baccarat, you can take to the tables. All good UK casino sites off the option, but Mr Green Casino and LeoVegas are particularly good. Happy playing!